Back a million years ago (or, 6), I taught high school Geometry. Since quilting is largely Geometric, I did a quilting unit. In December, I spent a week teaching the kids how to hand sew and provided them needles, pins, patterns, and some of my fabric scraps (and sent them out to buy their own). Day 1 was the “how to” and then there were a few days where they got to sew and talk (or, it was finals week, study). They then had until mid-March to make a quilt block. The official instructions were to make a 10″ block but as long as it was a block that stayed together, they got credit. They didn’t have to use my provided patterns and could design their own. They also could take it home and do it by machine. The pink-backgrounded block in the top left, down 1, over 1 – she designed that herself. I remember her showing me the design and saying, despondently, “My block is 12 inches and I don’t know how to make this 10 inches” and I told her “if you can make that, I will make it fit in the quilt”. It worked out since some of the other corner blocks were larger than 10″. In the center, there was a running class joke that pandas were purple… not sure how we got there, but that’s why there was a purple panda (and 3 or 4 of them worked on it). I added the dark green to square that up since it was a wonky panda. There’s also the Teenage Mutant Ninja Turtle on the right, which she designed herself (and executed beautifully). 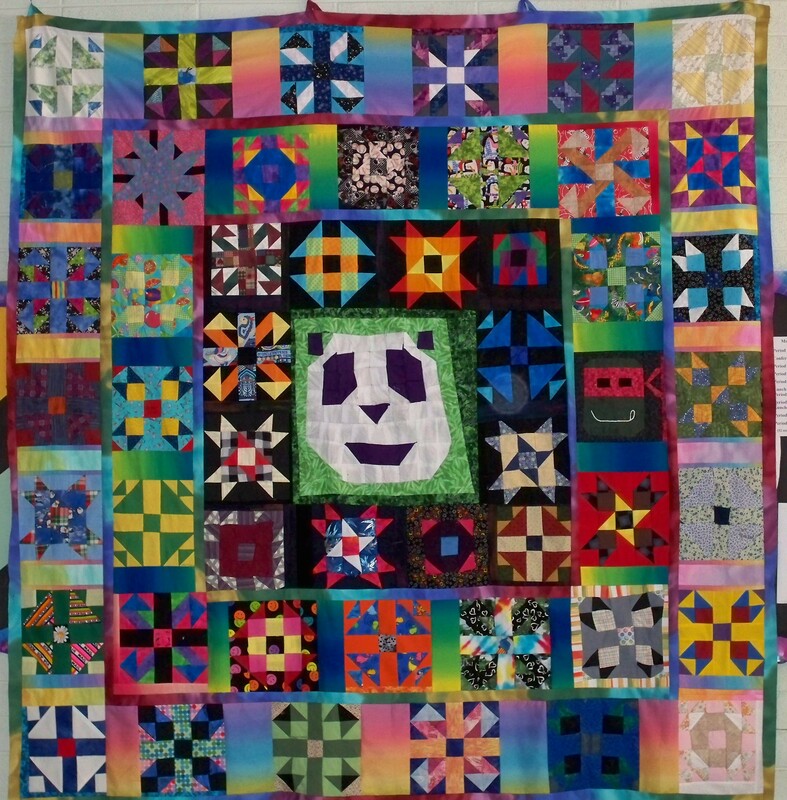 Looking at this quilt, I can match up about 1/2 of the blocks with which person did it off of the top of my head. The coolest part was when they brought their blocks in, how proud of them they were. It was a great experience. And a few years later, I received a Facebook message from one of the Panda guys saying “I had a button fall off my shirt and I sewed it back on!” and it made me giggle. At least they learned something in Geometry!